The fracking industry in Texas wants to take 30 BILLION GALLONS OF WATER from our rivers and treat it like trash that must be thrown away. Water doomed fracking trash will never be available for future generations. Do not let this happen! “Disposing of used water through properly operated and maintained injection well systems, into deep rock formations, essentially removes that water from the active hydrologic cycle. Conceivably, this water could return to the active hydrologic cycle at some very distant point in the future (speaking in geologic terms, well beyond human time frames). On January 11, the Angelina and Neches River Authority (ANRA) applied for a permit through the Texas Commission on Environmental Quality (TCEQ) to allow the oil and gas industry to pump over 3 billion gallons of water a year from the upper Angelina River Basin for the purpose of fracking. If allowed, this permit will be good for the next 10 years. 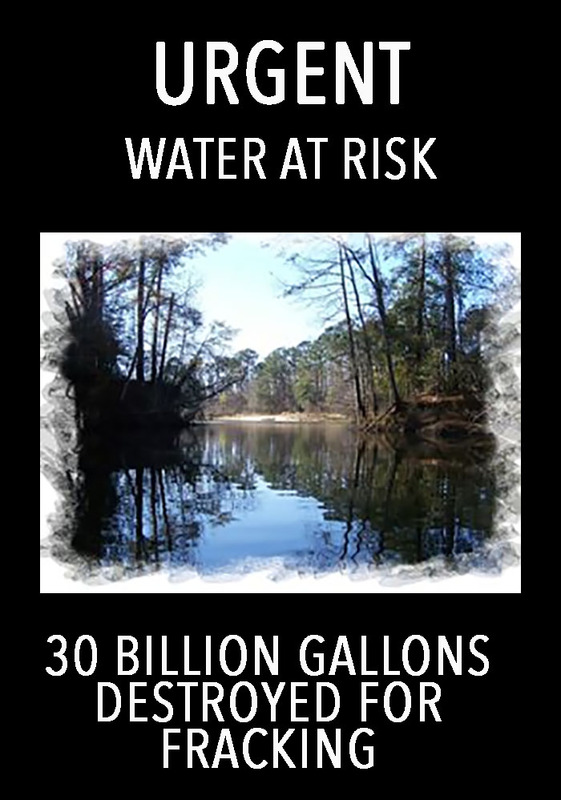 This permit, if allowed, would remove more than 30 billion gallons of water from the Angelina River over the next 10 years. This is water that can never be returned to the river- nor even to the water cycle, as fracked water contains added volatile compounds such as benzene, toluene, ethylbenzene and zylene- all of which pose significant dangers to human health and welfare. Disposing of fracked water involves pumping this solution deep into the ground in deep injection wells- an activity that has been conclusively connected to earthquakes. In East Texas, there have been numerous earthquakes in the Timpson/Tenaha area– some over 4.0 in magnitude. one that registered as 4.8 magnitude and caused structural damage to homes and cracked a water well for the municipal water supply. There are several deep injection wells used in the disposal of fracking waste around this community- and this is an area that had no earthquakes before these wells were put into use. So one might well ask the TCEQ what is going to happen to the 3+ billion gallons of water each year drawn from the Angelina, after it becomes contaminated with fracking chemicals? In December 2015, the agreement reached between governments at the Paris Climate Change Conference was that 75-80% of existent fossil fuels must remain untapped to avoid catastrophic overheating of our planet. In what way does the permit, to allow the withdrawal of 3+ billion gallons of water annually from the Angelina River over the next ten years for additional fracking, help to advance this goal? If you want to let TCEQ know your thoughts on this, I’ve been told that the only language they care about is if you mention water rights being affected. 3+ billion gallons a year drawn from this watershed, for the next 10 years will have an impact on future water needs for residents. Obviously there are many concerns with this permit being allowed, but water rights seem to be the key to stopping this. Wait until a frack quake breaks apart all of the high level nuclear waste containers in Andrews, TX and kills everyone in West Texas. Then maybe people will stop voting for Republican jerks who want to dismantle the EPA. Maybe. Or they will blame Obama.